provisions of the FFIEC IT Handbook not listed above. The Netwrix Auditor solution enables control over changes, access events and configurations to help ensure the confidentiality, integrity and availability of sensitive financial data in both on-premises and cloud-based IT systems and applications. This GLBA compliance software provides security intelligence to identify security holes, streamline user behavior analysis and investigate threat patterns in time to prevent disclosure of customer personal information. 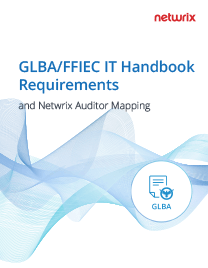 You don’t need to have a separate GLBA risk assessment software tool; with Netwrix Auditor, you get risk assessment and other compliance functionality all in one solution. It provides an overview of your security gaps in three major areas: account management, security permissions and data governance. 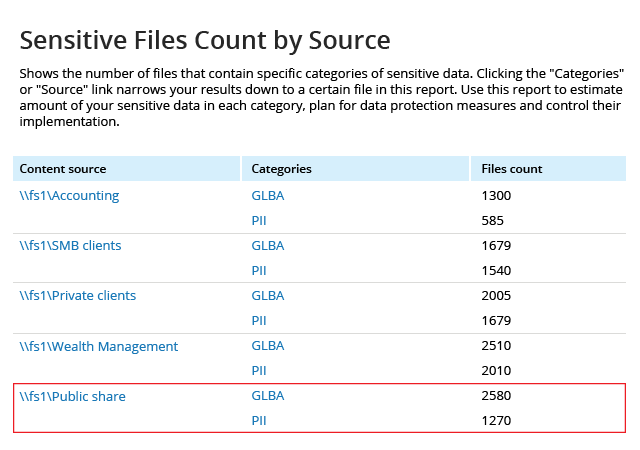 Netwrix Auditor reports on the exact location of regulated data stored on your file servers. Regularly review this information to detect sensitive data that surface outside of a secure location in a timely manner to minimize the risk of a data breach. 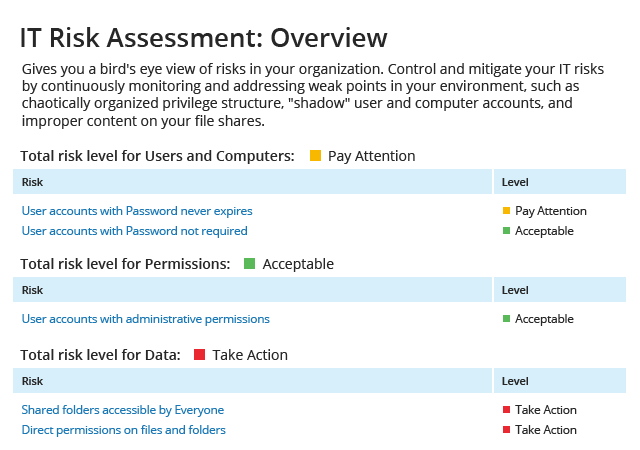 See exactly which data is at risk so you can protect it appropriately. Get alerted about all suspicious activity to block attacks in their early stages. For example, a login attempt to one of your network devices using the credentials of a disabled account might indicate external attackers trying to lay their hands on your critical resources. Improve the security of customer financial data with regular monitoring of data access rights. 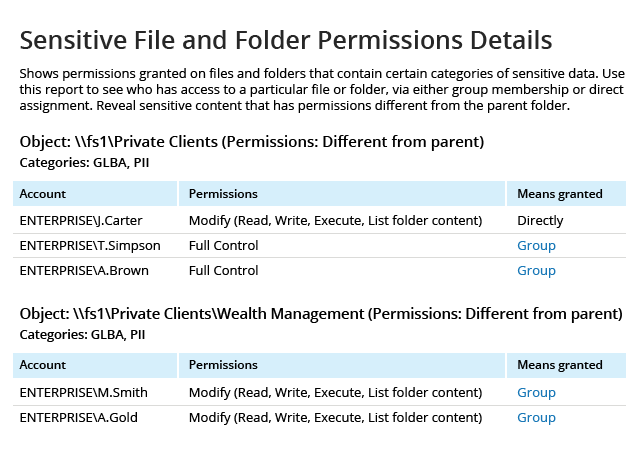 Verify that permissions are aligned with your enterprise security policy and employees’ job description. Contact data owners to get them involved in determining who should be able to view, edit, share or delete sensitive data. 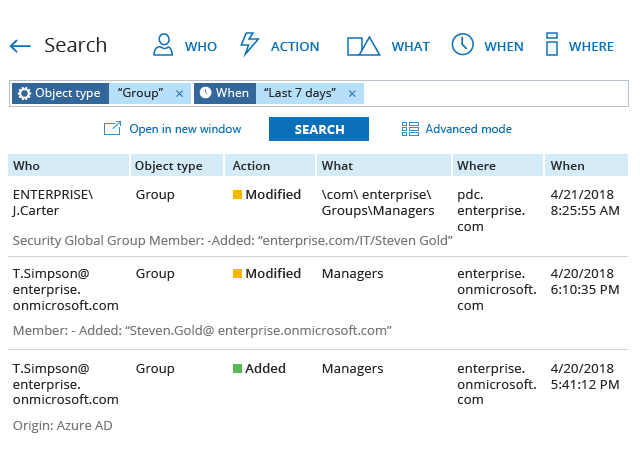 Unlike native log management tools, Netwrix Auditor enables you to quickly find the information in your complete audit trail; just fine-tune your search criteria until you find the exact information you need. Forreston State Bank saves 8 hours a week on auditing processes and ensures continuous compliance with FFIEC and GLBA requirements. Bank of the South consistently receives high ratings from the examiners and stays compliant with GLBA and PCI DSS regulatory standards.